Here's me picking the vojvodina hops. The ladder is 6 feet to give you an idea where the top of the trellis is. Vojvodina has a very low yield, small cones, and are delicate to pick. The bitterness is on the lower end and quite smooth. The aromatics remind me of hallertauer but its more subtle. We filled a half brown grocery bag with all of the vojvodina cones that were ready, some new cone growth was apparent. We also filled an entire bag with centennial. 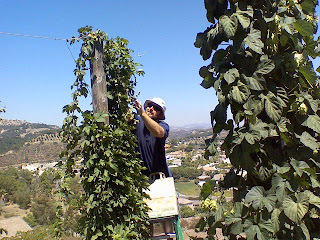 We barely put a dent in the hop picking today. The vines that made it this year are just loaded! Sent from my mobile phone.